Logo on mobile view – Not Clickable? Forums Joomla Templates Club JA Brickstore Logo on mobile view - Not Clickable? 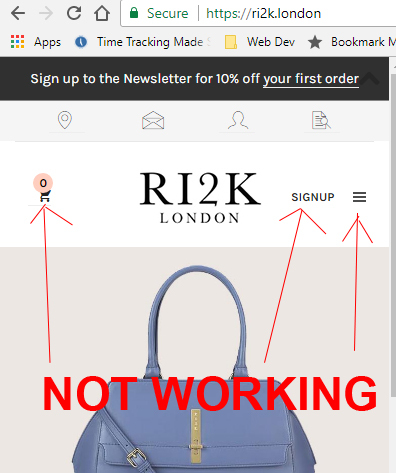 Hi there – My site is https://ri2k.london and when viewing my site on a very small browser or mobile view the main logo does not seem to be clickable. Could you please take a look to see what maybe occurring. That’s great I can now click the logo and it links OK! Another major problem has cropped up though, which is I can no longer click my ‘burger (side) menu’ icon and my other links on the mobile view (in that area) no longer work either. Please see attachment for the links and icons that don’t work. This reply was modified 1 year ago by Ch1vpH. Did you get it solved? as I can see these buttons/text are still clickable. No its was only working due the code above was not in the custom.css file…But I have now added it back on again…and the icons and links next to the logo no longer work. As I need the menu to still work on mobile whilst trying to fix this issue.…but when you come to have a look at the issue you will need to add in the custom code back in to the custom.css to see the problem. This topic contains 5 replies, has 2 voices, and was last updated by Ch1vpH 1 year ago.